As a child, Gabriel recalls playing among the drying coffee on his grandparent’s farm. He grew up with first-hand appreciation that coffee production was arduous, detailed, and extremely passionate work, but it was work that fascinated him. “Our family always let its successors choose their own path, their own career, but coffee has always brought our family together,” Gabriel says. Gabriel chose coffee as his profession, and so have his children, making them the family’s seventh generation of coffee producers. Named after the small chapel located on the farm, Gabriel’s parents Gabriel Senior and Flavia took over ownership of Bom Jesus from Gabriel Senior’s parents in 1971. Along with the farm’s agronomist, Gabriel’s brother Lucas, and mentorship from Odilon Americano Rodrigues Alves, Gabriel has watched the evolution of Alta Mogiana biome’s coffee production. Bom Jesus Owner Gabriel Oliveira and Minas Hill’s Marcelo Brussi. 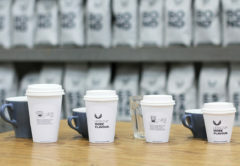 The current state of Brazil’s specialty coffee production is small, but for a continent-sized country producing countless flavour profiles, Gabriel says there’s still a lot to be learned, such as how much quality coffee can aggregate the price of specialty and create a better coffee drinking experience. But specialty coffee isn’t only about quality. Gabriel says it’s about the type of relationship producers share with roasters and distributing partners. 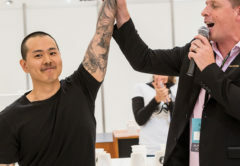 Gabriel says his four-year partnership with Australian coffee importers Minas Hill Coffee is one such relationship that represents more than just a coffee connection. “There is a mutual trust between the two companies and Marcelo Brussi [Minas Hill General Manager] is today a personal friend. We speak almost every night via Skype and I believe this is important to develop respect and trust, and to celebrate our achievements,” Gabriel says. Every year, Minas Hill brings a group of roasters from Australia to Brazil. It spends a week visiting the Bom Jesus farm, giving guests a first-hand look at how its coffees are processed. “At night we catch up around the bonfire, telling spooky stories from our folk tradition,” Gabriel says. 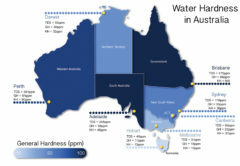 Minas Hill has been so influential and supportive of Gabriel’s specialty coffee production, it’s helped the Brazilian producer develop three coffees it sends to Australia’s mature market with flavour profiles it knows Australian roasters and consumers will love. The first is a natural processed Mundo Novo cultivar with a high level of sweetness and mandarin acidity. “Marcelo helped us to get this flavour and nowadays is the top of our range. 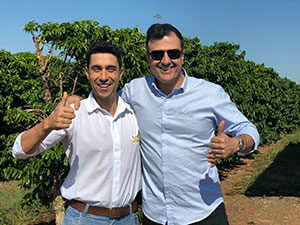 We have also developed a low-acidity coffee from another farm we own, Sao Lucas, in order to fulfil a demand for a good full-bodied, caramel flavour blend,” Gabriel says. 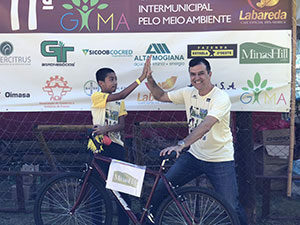 Minas Hill General Manager Marcelo Brussi supports Bom Jesus’ annual Gima event to support 1000 local children in Alta Mogiana. The other is a specialty grade blend from coffees on both farms, called Labareda Regional. Gabriel describes this blend as “clean and super sweet”. 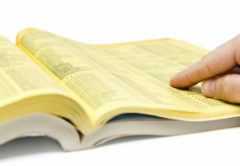 The key now, he says, is maintaining consistency and price, and translating its importance to customers. Bom Jesus currently plants 21 coffee varietals, with the highest proportion being Catuai, Bourbon, and Mundo Novo, and is constantly researching new cultivars and production methods. The farm produces naturals and pulped-natural coffees and is methodical about its drying methods. It uses a de-pulping machine for natural coffees and a patio to dry most of the coffees. Gabriel says patios are said to be obsolete but this natural energy from the sun is an effective method to dry his coffees. Bom Jesus also has a number of raised-beds for micro-lots and tanks for controlled fermentation. For ultimate control, Gabriel separates coffee lots in different wooden hulls so customers like Minas Hill always get the coffee they are buying without any confusion. 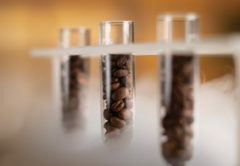 “We test each coffee individually before and after storing them, aiming for fully traceability and quality control. After the coffee is dried, we cup them again and what meets customers’ standard, we bag them and ship them to their countries,” Gabriel says. The aim is to produce coffees with a balance between sweetness, body, and acidity, but it is Bom Jesus coffee’s distinct caramel flavour that’s become internationally recognised thanks to the coffee’s high sugar content. 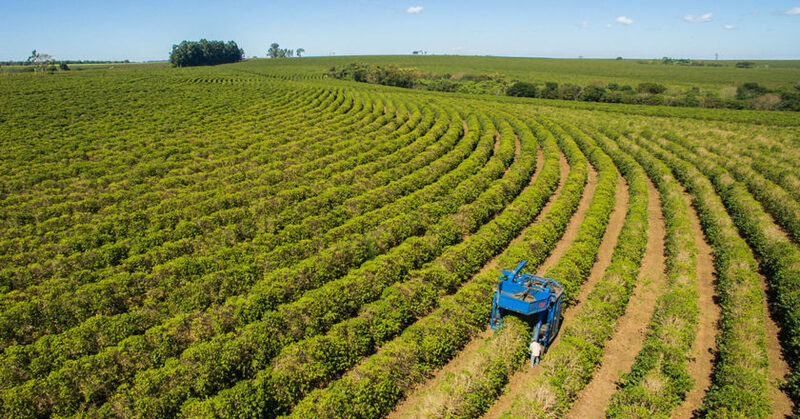 Bom Jesus produces 20,000 60-kilogram bags on average in harvest from April to September. In 1986, when Gabriel’s father and mother took the management control over his grandparent’s property, their first crop yield was just 1000 bags. Production has been through several ups and downs, but now yield has expanded rapidly despite the farm’s consistent battle with excessive rain and drought. Gabriel believes Bom Jesus’s current high-yield harvest is due to the farm’s rich preserved forest which attracts lots of Brazilian-wolves, ant eaters, armadillos and birds, such as toucans and hawks. By law, the farm is obliged to preserve 20 per cent of the land, but it’s now close to 40 per cent. “This is one of the reasons we rarely see insects attack and rusty leaves. Maybe this is the secret for our high-quality,” Gabriel says. The other reason is because of Bom Jesus’s “excellent terroir”, microclimate, “ideal altitude”, and propitious soil containing high sand and clay content for specialty coffee production. Being located close to the port of Santos is also an advantage, as is the farm’s proximity to five springs and a medium-sized river.